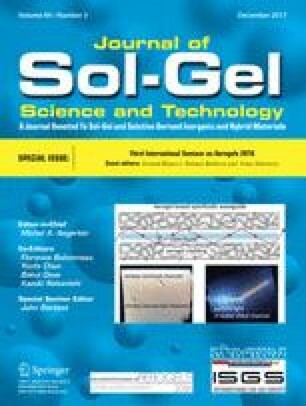 HKUST-1@silica aerogel composite pellets (HKUST-1@SiO2) were prepared by the coupled sol–gel and water-in-oil emulsion method using supercritical CO2 drying. The structure and morphology of HKUST-1@SiO2 were characterized by X-Ray diffraction, scanning electron microscopy and low-temperature nitrogen adsorption. According to these data, the composite represents physically dispersed micron-sized domains of HKUST-1 in the silica aerogel pellets. It was shown that the HKUST-1@SiO2 pellets can be used as a catalyst for isomerization of styrene oxide to phenyl acetaldehyde in a continuous flow reactor. The online version of this article (doi: 10.1007/s10971-017-4455-3) contains supplementary material, which is available to authorized users.